Author Ann B. Ross has written a total of 18 Miss Julia novels, as well as a short story, and I have read most of them, though not all. 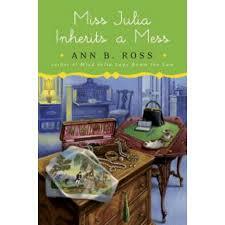 Her latest – Miss Julia Inherits a Mess – was as delightful as the others that I have read. Miss Julia Springer is 70-something year old woman, once married to Lloyd Springer, a not very nice man. In the first novel – Miss Julia Speaks Her Mind – her husband has just died, leaving her a very rich woman. Miss Julia soon learns that Lloyd had a mistress and a child. Rather than the more predictable reaction of anger, Miss Julia takes Hazel Marie and her son, Little Lloyd, into her home. Thus begins a series of adventures starring the unpredictable and loveable Miss Julia and her friends and neighbors in the small North Carolina town in which she lives. The Miss Julia series is not Pulitzer-Prize winning literature. The books are, however, a refreshing break from the serious and dark novels I often find myself reading. There is always a bit of a mystery, or at least some sort of obstacle that must be overcome. As with many of these small Southern town novels, there are a series of quirky and likable characters that come in and out of the stories. In Miss Julia Inherits a Mess, the septuagenarian learns that an elderly acquaintance has died, and, of all things, has named her the executrix of her estate. Miss Julia’s lawyer-husband Sam is away on a fishing trip and can be of little help. Predictably, Miss Julia runs into problems, including a mysterious alleged nephew who is claiming her estate. The problem is that it appears that Mattie Freeman’s estate amounts to almost nothing. Or does it? These books aren’t really about the plot, of course, but about the relationships and the people Miss Julia impacts daily. The books are fun and light and can almost be read in one sitting. Spend an afternoon with Miss Julia and her friends, and you’ll end up with a smile on your face.